Risotto – Better prepared In U.S. than any Pasta dish. I have no idea why this is, but, I can guess. For one, Risotto is surprisingly easy to make. Despite all the hoopla and magic surrounding it any fifth grader can prepare Risotto with ease. Another reason is that Americans are accustomed to eating steamed rice. That’s much chewier than boiled rice. Most Pasta experiences Americans have are overcooked versions. That lends itself to bland, gooey aberrations of traditional flavors. Risotto lends itself to endlessly different flavor combinations. The delicious, creamy, yet nutty blandness of Arborio rice is a perfect transfer medium. Growing up my favorite Risotto was one my mother, Lucrezia, made. She used Asparagus, pancetta (bacon), and Gruyere Cheese in the Risotto. Take a peak at our YouTube video on making Risotto. Giuliana gives you the real scoop on preparing Risotto properly. THIS is the TRADITIONAL, Italian method for making Risotto and she executes it perfectly. Broil the pound of bacon in a drip pan until crunchy brown. Set aside on paper towels and let dry. Save all the drippings. Boil one bunch of asparagus in about two quarts of water until very soft. Takes about 15 minutes. Remove the hard, tough ends with a knife before cooking. Remove and drain well. SAVE all the cooking water and the drained water. Next, blend or food process the overcooked asparagus until you have a nice smooth slurry of asparagus. 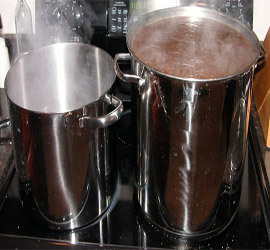 Add some of the cooking water, OR STOCK, if necessary to get a smooth, runny mix. In a large pan (the more surface area the faster and better the Risotto will cook). Over a high heat, sauté the two medium onions and the 2 cups of Arborio Rice. Sauté them in some of the bacon drippings until golden brown, stirring the whole time. Pour in the blended asparagus and begin stirring the rice. Add two or three large cooking spoons of the asparagus cooking water as needed. Stir until it is absorbed by the rice mixture. Add a few pinches of sea salt and plenty of coarse black pepper. Do this as you continue to stir. Make sure not to over salt the mix. Keep adding asparagus STOCK to the rice. It needs to reach a tender, but still firm texture. And has thrown off its creamy starchiness to the mix. Then add the second bunch of asparagus. Be sure to trim all the tough end pieces and cut up into two inch sections. Stir the chopped, fresh asparagus in for about two or three minutes. Stir until tender, using a spoonful or two of cooking water if necessary. Just before serving crumble up the crunchy bacon into bits and add to the mix. Then add the 1/2 lb. of grated Gruyere Cheese to the Risotto and stir. Top each serving with a spoonful of bacon drippings and additional grated Gruyere. Serve immediately as the dish will continue to cook while it sits. 1 Comment on Risotto – Better Prepared In The U.S. 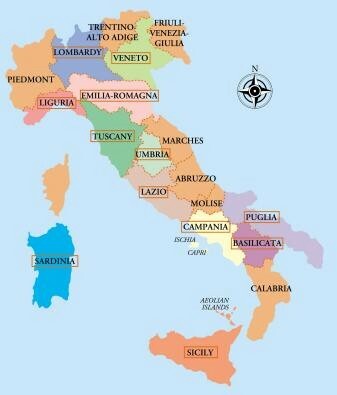 Despite its tiny size, Italy has a number of disparately different climates. That’s good for growing specific food crops in each of the climates. Climates range from desert hot in Sicily in the south to mountainous cold in Torino in the north. Regional dishes like Pasta and Eggplant are deeply influenced by Italy’s various climates. One common example of this geographic difference is the more common use of olive oil in the southern part of the country and butter and cream in the north. Olive trees need long, warm, dry seasons to produce abundant amounts of quality olives which are then pressed for their oil. Cows need land and a whole lot of grass to make milk. Sicily has little of either. But in the Northern mountainous regions bordering Switzerland there’s more land area and plenty of grasses. This local availability of crops translates to local availability of quality ingredients in each area. While there are many subtle and not so subtle differences in ingredients and recipes throughout the twenty regions of Italy there are many common and authentic techniques that are prevalent throughout. One of them is browning or sautéing. Americans are more apt to sauté or broil something lightly. And most Italians enjoy a much darker, crunchier finished product. Pasta in Italy is invariably prepared just before serving, not cooked in advance and then reheated. 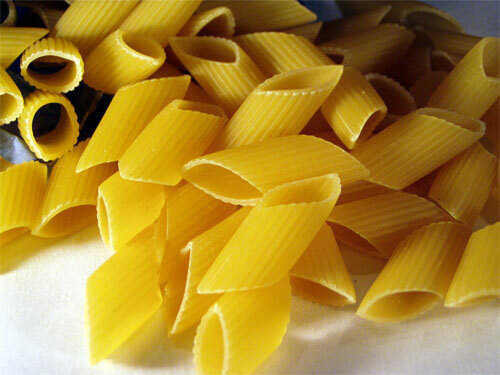 Most of Italy enjoys its pasta al dente or extra firm. And Americans have been conditioned to eat pasta that is soft and mushy. Not very authentic and a true crime in my opinion. Here’s an authentic, simple and unforgettable Pasta and Eggplant recipe. They’re perfect for the Sicilian harvest season since the eggplants in this recipe are grown there. And yes, you could substitute. Partially peel and then cut the eggplants in half. Spray eggplants with olive oil on both sides and grill them under a high heat until they are very dark brown, almost burnt. Mash eggplants together in a bowl with two large cloves of finely chopped garlic, more olive oil, sea salt to taste, and black pepper. Cook 1 lb. of thick linguini extra firm, or al dente, drain, add to the eggplant mix and toss well until all the pasta is covered in oil and eggplant. Serve your Pasta and Eggplant dish immediately and top with Parmiggiano-Reggiano cheese. This process shouldn’t take more than one half hour from when you start peeling the eggplants to sitting down with your favorite glass of extra cold white wine with your finished Pasta and Eggplant dish. Start by heating the pasta water while you grill the eggplants. By pairing specific dishes, like Pasta and Eggplant, with the best locations of crops, like eggplant (in this case, Sicilian eggplant), insures that the ingredients and flavors are optimal. By the time the eggplants are crispy golden brown the water is boiling and ready for the pasta. Remember to cook your pasta at least several minutes less than the pasta box directions call for. The pasta manufacturers assume Americans prefer their pasta softer. Don’t be fooled. Pasta is at its nuttiest and tastiest best when extra firm or al dente. Another version of Pasta and Eggplant calls for topping it with ample amounts of room temperature Marinara Sauce which every Italian has in the refrigerator and Pecorino Romano Cheese instead of Parmigiano-Reggiano. Yet another incredible version of Pasta and Eggplant is to add large dollops of warmed ricotta AND Marinara Sauce to it, stirring lightly in the serving dish. I say try it all three ways . . . this is authentic Pasta and Eggplant at its finest! Experience the ultimate, the healthiest, Mediterranean Diet Pasta Sauce Recipe of them all – Salsa di Pomodoro Cruda or Raw Tomato Sauce. I bought beautifully ripe, locally grown, on the vine tomatoes for .99 cents a pound yesterday, so this is a Mediterranean Diet recipe anyone can afford. It’s also so easy to make you’ll scratch your head and ask why you’ve never tried it before. As we discussed in a previous blog the most recent scientific consensus is that the Mediterranean diet, full of fresh vegetables, fruit, grains and olive oil, can greatly reduce the risk of disease and lead to a longer, healthier life. Salsa di Pomodoro Cruda / Raw Tomato Sauce is the perfect combination of those elements, and completely uncooked. This particular version is a sublimely delicious Mediterranean diet concoction. We would make a Salsa Cruda or Raw Sauce, in some shape or form, almost every day during tomato season when I was growing up. There are dozens of variations of this raw, heavenly Mediterranean diet mixture. The one described below is one of my favorites. My father farmed many acres of specialty vegetables, including a half dozen varieties of both heirloom and hybrid trellis tomatoes. My hands would be so green by the first week in September from tending tomato vines and picking and packing tomatoes all summer that I would be embarrassed to go back to school each fall. Don’t blink while you’re reading or you’ll miss it. Here’s how easy this Mediterranean diet recipe is. Spaghetti or Macaroni – 1 lb. Mix all of these ingredients (except for the pasta, naturally – just checking to see if you’re paying attention) into a large high sided bowl and allow them to marinate while you cook your pasta. Stir the mixture well so that the tomatoes begin to macerate and watch to see if it thickens. If it doesn’t, add a bit more olive oil at a time until it does. A shallow dish will not do for this. Cook your pasta, until it is extra firm, in well salted water. The second it is done, drain it well, and throw it into the raw tomato mixture. Then stir or toss like you would a salad, making sure every bit of pasta is covered with the mixture. Serve immediately with an additional dusting of Pecorino Romano cheese if you like. An extra cold, sparkling white wine goes perfectly with this dish. According to a recent Harris Poll more people in the United States choose Italian food when eating out than any other. When you subtract fast food from the equation and consider only sit down, menu type restaurants, the percentages are even higher, by far. My best guess is that we are all programmed by Nature to eat as many things that are good for us as possible. That’s despite the best efforts of the food processing industry to narrow everything we eat down to highly processed corn or soy products. Italian cuisine lends itself to this anthropological need to eat a large variety of foods in many ways. In a perfect world it is every cook or chef’s dream to walk out the back door of their kitchen and harvest, with their own hands, all of the ingredients for the meals they prepare. At one time, even in the U.S. this was a distinct possibility. According to the U.S. Department of Agriculture the number of farms peaked in 1935 at 7 million. By 1997 that number had fallen to 1.7 million. This meant that locally grown, harvested that day food, is fewer and farther between everywhere in the U.S. The deluge of nutrition information thrown at us every day is incredible. Just about every newspaper has a food and cooking section touting “healthful” recipes. And Italian food is among them. We are reminded constantly by email and everyone from Dr. Oz to PBS specials about how important healthy eating is. That we should be consuming more unprocessed, fresh fruits and vegetables, fish, lean meats, monounsaturated fats, nuts, whole grains, and foods rich in anti-oxidants and Omega-3 fatty acids. What we know as Italian cuisine evolved, beginning in the 4 th century B.C., on the Italian peninsula, which has one of the most perfect growing climates on earth. Consequently, this (Italian food) food does naturally just about everything that most modern scientific evidence suggests we should do to remain as healthy and disease free as possible. The most recent results of the comprehensive Nurse’s Health Study suggests that The Mediterranean Diet (mostly Italian food) reduces the risk of heart disease and many cancers by up to 30%. The number of pasta recipes alone that qualify as healthy are staggering. You can prepare no fat or very low fat pasta, vegetable, fish, or meat dishes and not repeat yourself for a year. Any vegetable from broccoli to zucchini can be prepared with pasta in a vast array of ways. But unlike most highly processed low fat foods, that leave you hollow and wanting more, Italian food delivers the goods. Italian dishes such as pasta with broccoli sautéed in garlic and olive oil or chicken and Ziti with broccoli not only have great flavor but have that “stick to your ribs” satisfaction we all crave. Another important nutritional aspect of Italian food is olive oil. The medical world has been telling us now for years that we need to replace saturated or animal fats in our diet with monounsaturated fats like olive oil. Since olive oil is one of the foundations of Italian food it too is a perfect complement to a healthy diet. It provides both the taste we crave and the right nutrition. So, is Italian food popular because we love the taste or because those tastes have been genetically programmed into us by Nature? That question we’ll have to leave up to anthropologists and geneticists. And for good reason. Tomatoes and tomato sauce are both important components of many Italian Food recipes. In a perfect world one would walk outside to their garden and gather tomatoes to make tomato sauce. You could choose from any number of varieties of non-hybridized or heirloom tomatoes. With varying degrees of ripeness. Green for frying with breadcrumbs. Semi-ripe for salads and as sandwich toppings. And very ripe for tomato sauce. The skin would be thin and the tomato flavor overpowering. But this is not a perfect world. Huge corporate seed companies made a decision decades ago. They decided the market demanded commercially raised tomatoes. And they needed to be picked by machine to save labor. They had to be harvested green, not ripe. So they could travel long distances. And also not suffer damage. And be ready for artificial ripening in a gas filled room. They also decided that all tomatoes had to look perfect. No craggy surfaces or brown spots. Totally symmetrical. Tomato asthetics is not a big concern when making tomato sauce though. It’s all about the flavor. This breeding process produced gorgeous looking tomatoes. But unfortunately with a waxy, thick skin. And mealy meat and very little tomato flavor. 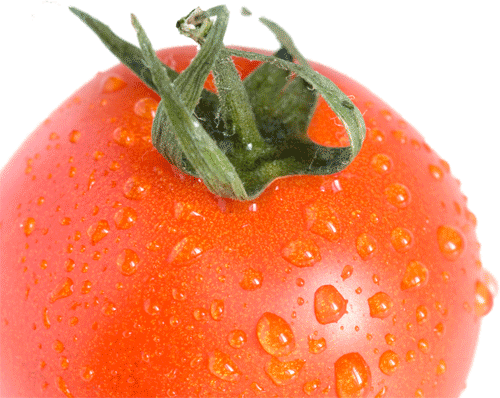 Today, virtually every variety of tomato has been hybridized in this fashion. Older varieties, heirloom tomatoes, still exist. But only because small farmers are filling the need. Tomato purists are demanding these older seeds. They require much more care and produce uneven fruit. But the flavor… oh… the flavor. And that flavor is magnificent in tomato sauce. Ironically, even many heirloom or older seeds have been hybridized to a degree somewhere along the line. That’s to improve disease resistance. They’re still much more delicious than the average “new age” tomato. But they lack the true flavor of the original Open-Pollinated plants. Fortunately there are specialty seed houses worldwide. They produce very old, non-hybridized tomato seeds. They’re readily available for purchase online. And they’re great for making tomato sauce. Here in the U.S., commercial heirloom production is increasing. But not enough to make them affordable to the average consumer. At least not yet. Large scale commercial heirloom tomato production is still in full swing. Especially in the San Marzano region of Italy. This is near Naples where some of the world’s finest tomatoes are grown. San Marzano tomatoes are plum shaped. They’re similar to the Roma variety, but thinner. And they have a much more delicate, thin skin. And a powerful tomato flavor. Perfect for tomato sauce. Heirloom tomatoes like San Marzano are Open-Pollinated varieties. They change very little from one season to the next. The Italian government has designated that true San Marzano tomatoes are precisely labeled. Like many other authentic foods and cheeses, they bear the D.O.G. label. Otherwise known as the European Union’s Designation Of Origin label. The label is on every can or container, so they are easy to identify in the store. There’s another label that identifies these authentic food products, from Italy, too. And that is DOP certified: Denominazione di Origine Protetta. Or Protected Designation of Origin. If you want to use tomatoes in cans or containers to make tomato sauce, these are the ones to get. We highly recommended them. My two favorite producers of San Marzano are the Cento and Pomi brands. Both are readily available in stores. And both companies produce very reasonably priced tomatoes. These are excellent for making tomato sauce. Cento makes an all natural puree, without preservatives. I bought some last week at my local grocery store for $1.29 per can. You can also get most Pomi all natural, unpreserved cans for around $2.25. Most importantly, they give you a choice of tomatoes with or without preservatives. Specifically Citric Acid. When choosing canned or preserved tomatoes ALWAYS choose those packed WITHOUT Citric Acid if you have a choice. Tomatoes canned without preservatives can mimic and many times even rival fresh, vine ripened tomatoes for flavor. Again, excellent for making tomato sauce. The Holy Grail of achieving the finest, most extraordinary flavor for tomato sauce? It’s the just picked, vine ripened, heirloom variety tomato. Italian variety or not. Fresh, extra ripe, vine ripened heirloom tomatoes – WAY TOO EXPENSIVE. Fresh, extra ripe, vine ripened hybrid tomatoes – WAY TOO EXPENSIVE. Canned Tomatoes WITHOUT CITRIC ACID or other preservatives – THE WINNER!!!! Canned Tomatoes with Citric Acid or other preservatives – ONLY WHEN NECESSARY. 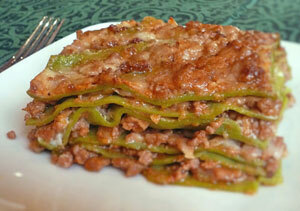 Lasagne Verdi alla Bolognese is a dish to approach with the reverence Italians show it. And at a moment when you have plenty of time to enjoy the process. Lasagne is an absolute masterpiece of Italian cuisine. A dish you do properly or not all. That means a recipe with everything done from scratch. Anything else is not authentic. And not worth the name or the time. 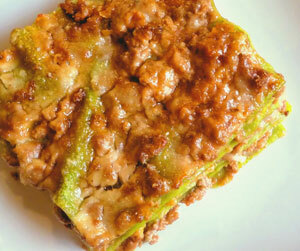 Lasagne Verdi alla Bolognese is a dish/recipe for special occasions. To be made with love and care for your nearest and dearest. Knowing the patience and effort you invest will be richly rewarded! Lasagne is better made a day or two before. It can be frozen. Lasagne can be made ahead, then covered with buttered paper and refrigerated. Soften all the finely minced vegetables in a wide shallow skillet. Cook over low heat till very soft in the fat. They must not color or fry so pour in 1 tbsp. of water from time to time to prevent that. As they must not be visible in the final Bolognese sauce. It takes about 20 minutes in this stage. Add the pancetta and soften adding 1 tbsp. water when needed as before. When the pancetta is very soft, remove sausage from the casing and combine with the ground beef to the pan. Sauté thoroughly over moderate heat to evaporate the water but avoid browning or crumbling. Pour in wine and allow to evaporate completely on low heat. Then combine milk and again allow to evaporate. Add the tomato passata to colour just a little (real Bolognese is never ever red!). Taste and season with salt (if needed), pepper and nutmeg. Transfer the sauce from the skillet to a narrow deep and heavy bottom pot. Pour in half a cup of water and start the sauce on its long, slow gentle 3 1/2 hour simmer! Stir the sauce regularly and pour in water as it reduces, but never more than a ladle of water at a time. When the Ragu is almost ready the fat separates and you can either tip the pan a little so you can spoon most of it out. Or if making ahead you can remove the fat when it has cooled and solidified. Place the milk over heat, with the bay leaf if using. In a separate pan big enough to take the boiling milk, cook the flour and butter together on low heat to make the “roux”. When the milk comes to the boil, take both pans off the heat and add the milk all at once to the flour mix. Whisk vigorously to get a smooth thick lump free sacue. Season with salt and nutmeg if using. Return to low heat for about 3 minutes to cook out any raw flour taste. Cook the spinach, leave to cool. Squeeze as hard as you can to remove all water. Then whiz in a processor. Make a well in the sifted flour and in the middle add the beaten eggs previously combined with the spinach. Gently work into a dough. Knead 10 minutes or till the dough is smooth, elastic and fairly firm. Leave to rest at least 30 minutes in a plastic bag. Then roll out wide strips on the pasta machine and cut into 4 inch squares. Bring a large pan of water to a boil. Add salt and a little oil, then cook the just made lasagne 2 or 3 pieces at a time for about 2 minutes. Remove squares and immediately plunge into cold water, then place on clean kitchen towels and pat dry. Everyone has their own idea about how to layer the lasagne ingredients. This is just one way. In Bologna, very small amounts of ragù and bèchamel are used. So the lasagne is rich (but not “gloop-ey”) and easy to digest. Lightly oil a rectangular baking dish. On the bottom arrange a first layer of pasta. Place a small amount of Ragu on this. Use the back of a spoon to spread it without worrying about covering every bit of the lasagne. Dab teaspoons of béchamel on top of the ragù. Then add another layer of lasagne noodles, a little Ragù, a little béchamel, a little Ragù, and so on. It is nice to get 5 or 6 layers of thinly rolled lasagne noodles into your lasagne. Finish dish with a layer of lasagne noodles. And this time swirl the Bologonese Ragù and Bechamel together. Then top with plenty of grated Parmigiano-Reggiano and dot with dabs of butter. Bake lasagne covered at 325° F for 20 minutes and uncovered for another 10 minutes. Leave lasagne to rest 10 minutes before serving directly from the baking dish. Carmelita Caruana runs the Cook Italy Cooking School based in Bologna, Italy. An Italian food expert and culinary consultant, her writing has been featured in major British newspapers and food magazines. Carmelita has appeared on British TV and held classes in various U.S. cities. Leave a Comment on Lasagne Verdi alla Bolognese – best recipe! Approach this legendary long and slow simmered Pasta Sauce – Ragù alla Napoletana – on bended knee. It is the pride of the rich cuisine of Naples. And can move Neapolitans to tears! It’s traditionally served over pasta. 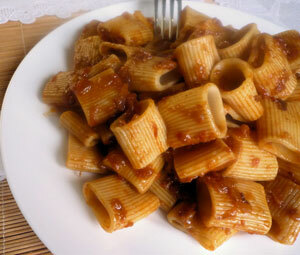 Pasta Sauce (Ragù alla Napoletana) origins lie among the upper middle classes, not the country folk. It’s enriched with two kinds of meat. It is a dish for feast days and holidays. And for weddings and special occasions. It may be further enriched with the addition of unseasoned butcher’s knife-chopped pork sausages. And large beef and pork skin rolls bound up with string. After being filled with chopped parsley, garlic, pine nuts, raisins and cheese shavings. A truly magnificent feast! Pasta Sauce – Ragù alla Napoletana! 2 lbs chuck roast in one piece, 12 oz meaty pork ribs, 7 oz thinly sliced salt cured Lardo or substitute Italian Pancetta or San Daniele cured ham to wrap the beef, ¼ cup e.v. olive oil, 1 ½ lbs sweet onions, 2 ½ cups red or white wine, 2 tbsp. tomato paste, 1 x 28 oz can best peeled plum tomatoes, a bay leaf, salt and pepper, optional: a few sprigs of fresh basil. Chop the onions quite small. They give body to the pasta sauce. But there should be no trace of them at all at in the finished meat sauce. Wrap the beef all round in the Lardo or cured ham slices. That will baste the beef and enrich the pasta sauce. Tie tightly with string so that the beef holds its shape during cooking. Put the contents of the can of peeled plum tomatoes through the food mill or a sieve. That eliminates any bits of peel and seeds and set aside. In a deep heavy pot brown the meats lightly in the olive oil till well colored. Then deglaze with half a cup wine. Scrape up any tasty browned bits and stir to dissolve. Evaporate the wine on fairly high heat. Add the chopped onions to the meats with the bay leaf. Season sparingly with salt and pepper. Cook covered on low heat for about an hour so that the onions soften and release all their juices. Turn the meats from time to time. Take the lid off and enjoy the aromas! Continue simmering on low heat for another hour or more. Do this until the onions are softened and lightly colored and their liquid evaporated. Keep turning the meat and stirring the onions from time to time. Nothing should stick to the bottom. Deglaze a second time with half a cup wine wine. And this time let the wine evaporate slowly over low heat. Add remaining wine, top up with a cup of water and continue to gently simmer uncovered. Turn meats and onions regularly and add water as needed. After another hour has passed, or when the onions have wilted to a mush and there is only very little liquid, dilute the tomato paste in a little hot water and add to the pot of pasta sauce. Cook it for a few minutes to dry and darken it a little. Then add the sieved peeled plum tomatoes and a glass of water to the pasta sauce. Bring to the boil, let bubble for a minute then turn down to low. Simmer 30 minutes more before removing the pork ribs. Cook for a further 60 minutes or until the beef is very tender but not quite falling apart. Remove the beef and the bay leaf and leave the pasta sauce to reduce until it becomes shiny, dense and unctuous. At least 30 minutes. Skim off any excess fat from the surface then taste and adjust seasoning. Since this pasta sauce is best made a day ahead, you may also remove the fat the next day. By then it should have solidified, leaving just enough to give the pasta sauce a shimmering gleam. Turn off the heat, and only in summer when basil is in season, plunge a few large sprigs of basil in the pasta sauce. This will impart its aromas. Remove the basil when you are ready to serve. This sumptuous pasta sauce needs a good chunky pasta to do it justice. Use it to crown a large format tube pasta like Paccheri, Rigatoni or Mezze Maniche. Never use pasta like Spaghetti or Fettuccine. The meats you return to the pasta sauce to re-heat. Then you keep them warm while eating the pasta. And serve as the second course along with poached broccoli or other seasonal vegetables. But never eat potatoes after pasta. To serve in the traditional manner: place about half the pasta sauce in a separate small pan. Keep both sauces warm while you cook about 2 ½ cups pasta very “al dente”. The pasta is going to continue cooking while you toss and mix, while people are being served, and even on each diner’s plate. As soon as the pasta is ready, drain the pasta and immediately mix with the pasta sauce in the original cooking pot. Pile the pasta sauce into a beautiful wide and shallow bowl and pour a couple of ladles of the extra sauce on top of the pasta. Place a chunk of good aged Pecorino or Parmigiano-Reggiano for diners to grate onto their plate, if they wish. Any extra pasta sauce may be placed in a small bowl with a ladle for diners to add to their pasta. Or else it may be diluted with some hot water and poured over the second course meats. Serve the pasta at once — to rounds of applause! An appropriately distinguished full name for this feast day dish to enjoy on Sundays and for special celebrations. Essentially, it’s party fare to relish at gatherings of family and friends. 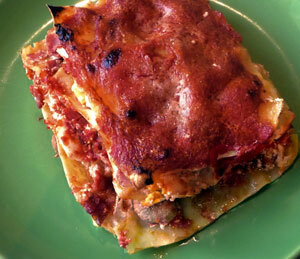 Once Lasagna Napoletana was associated with Mardi Gras. That’s the last day of meat eating before the Catholic Lent fast begins. Hence “Carnevale” which literally translates as “meat is valid”. This recipe has three elements. (1) The Ragù recipe, which should be a classic Naples Ragù recipe. But made only with pork meats and sausages. (2) The Pasta recipe, ideally using durum wheat rippled Lasagna sheets. (3) The Filling recipe. That always includes little meatballs, ricotta and sliced hard boiled eggs. It also includes a grating cheese for the top. And either the fresh Naples sausages called “Cervellatine” or else spicy Napoli Salami, but never both. The Lasagna Napoletana recipe can also include sliced Mozzarella. Although it must be cows’ milk labeled Fior di Latte. It must not be Mozzarella di Bufala. That’s too watery to use in the recipe. You can play with these recipe elements. Then make your Lasagna Napoletana as you prefer adding more of this and less of that. You can omit the eggs. 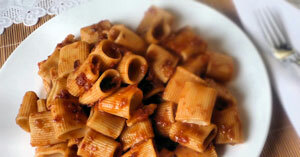 Or you can use a simple tomato sauce recipe instead of the classic ragù recipe. My advice is to keep the cheese elements of the recipe to a minimum. Cheese is very hard to digest. And this can also make this gloriously rich Lasagna Napoletana uncomfortably heavy. Lasagna improves with waiting. It likes time for the flavors to blend and the elements to settle. Some make the recipe a day or two ahead and reheat by covering and steaming. Others simply leave it to wait in the turned off oven. Sometimes for two, even three hours before serving. Lasagna Napoletana is best savored when eaten just warm, not hot. You can make this recipe ahead. It will freeze well. Cook the Lasgana sheets 2 or 3 a time in plenty of salted boiling water. Dip each into cold water as soon as it is cooked al dente. Then place on clean kitchen towels to dry. Grate the cheese into a bowl then break the egg into the same bowl. Mix the two together. Then combine thoroughly with the crumbled soaked bread and the ground pork. If your pork is very lean, add a tablespoonful or two of ricotta to the recipe mixture to soften it. With water dampened hands shape into tiny spherical meatballs no bigger than a hazelnut (filbert). Heat the olive oil in a wide skillet and fry the meatballs, rolling them round so they brown evenly. Place on kitchen paper to absorb excess oil. If using the Cervellatine sausages, cut in thin slices. Brown briefly in the pan where you cooked the meatballs. If using the Napoli Salami, cut into small diced pieces. Grate the cheese you will be reserving for the topping. That’s Pecorino Sardo or Parmigiano-Reggiano. Mix the ricotta in a bowl mashing out any lumps. Then add 3 or 4 tablespoonfuls of ragù. Blend perfectly to a creamy consistency. 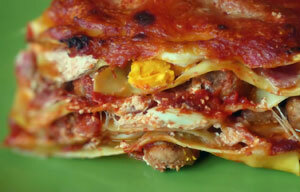 This Lasagna Napoletana recipe calls for 5 layers of pasta and filling. So butter a rectangular baking dish that’s deep enough. Place a small amount of ragù on the bottom of the dish. Then cover the base completely with pasta squares. Avoid overlapping the pasta pieces but cut to fit instead. Place a good layer of the ricotta cream as a bed. Then distribute a quarter of the meatballs, sliced egg, sliced Mozzarella, and either sausage or salami all over the ricotta. Top with ragù. Repeat 3 times so you have 4 layers of pasta sheets, toppings and ragù. Place the 5th layer of lasagna sheets on top of the last layer of filling. Top it with ragù. Then sprinkle the grated topping cheese over the whole surface. Cover the dish with foil and bake in an oven. Preheat to 375 ° for 25 minutes. Turn the oven off and leave the Lasagna Napoletana covered. Have it wait in the turned off oven for two to three hours. At the end of that time remove the foil. Turn on overhead heat or broiler. Give the Lasagna 20 minutes to crisp and color the cheese on top. Wait at least 20 minutes before serving lukewarm. That’s the best temperature for fully savoring this culinary masterpiece! You can bake and refrigerate then heat it up for eating the following day. You can also freeze the whole Lasagna unbaked. Spaghetti and sauce should come together in one mouthful. 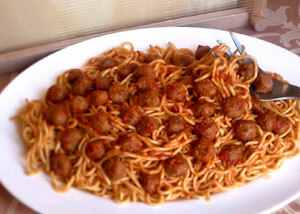 And large meatballs, as well as Bolognese ragù, should slip and slide off the slippery cylindrical spaghetti. So where do spaghetti and meatballs come from? And what’s the most authentic spaghetti and meatballs recipe out there? The answer is Abruzzo, Italy. 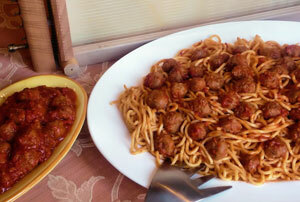 And Carmelita Caruana’s spaghetti and meatballs recipe at The Pasta Channel! In Abruzzo, the hand made Spaghetti alla Chitarra are not cylindrical. They’re square in the cross section. The Chitarra (Italian for guitar) is a special kitchen tool. It has strings pulled tautly across a wooden frame. The spaghetti dough is rolled out as high as the space between the strings. Then it’s cut on the Chitarra. They’re about a dime and a half thick. And the meatballs, called “Pallotte” in dialect, are tiny. No bigger than a hazel nut (filbert). Made this way, this spaghetti and meatballs works. And the spaghetti, sauce and meatballs combine in a single tasty mouthful as they should. If you can buy packaged Spaghetti (alla Chitarra) for this spaghetti and meatballs recipe, great. If not, use Linguine. Or use your own dough recipe. And roll it out no thinner than the third setting on the pasta machine. And cut it into ribbons using the narrower setting. For this spaghetti and meatballs recipe, you really must keep the meatballs very small. Some would say no bigger than the finger nail on your little finger. That’s the secret for coming close to the authentic original Abruzzo dish, “Maccherone con le Pallotte”. And this spaghetti and meatballs recipe gets very close to the original. Here’s the ingredients to make your own spaghetti dough for this recipe. 4 ½ cups semolina flour, 4 eggs, 1 tbsp of olive oil, and a little warm water. More if the dough needs it. Leave the dough to rest in a plastic bag for 30 minutes. And after cutting the noodles, place them on clean cloths. Then leave on a natural woven basket to dry for about an hour. For special occasions, you can modify this spaghetti recipe. Cook diced lamb and crumbled pork sausage in the sauce for 2 to 3 hours. 7 oz finely ground lamb shoulder. Or half lamb and half pork or veal. 3 ½ oz grated Pecorino Sardo or Parmigiano-Reggiano. Romano is too salty. Prepare the tomato paste by diluting it in ¼ cup of hot water. For this recipe especially, put the contents of the cans of tomatoes through a food mill. This will eliminate seeds, peel and hard bits. Then discard anything left behind. Heat the olive oil in a wide deep skillet. This is where you will later toss the cooked spaghetti. Add the diluted tomato paste, the sliced chili and the fresh bay leaf. Fry for half a minute to darken the tomato paste as you stir and mix. Add the sieved tomato passata. Stir to combine and season to taste with salt, pepper and nutmeg. Turn the heat down and leave to simmer gently, uncovered. Simmer for at least an hour. 2 or 3 hours is even better. Be sure to add small amounts of water. Otherwise the sauce reduces and thickens too much. When you are ready to serve the sauce, taste and adjust seasoning. In summer, prepare the spaghetti sauce recipe using fresh vine ripened tomatoes. The sauce recipe can be made ahead and frozen. Cut crusts off the bread and discard. Break the rest up into small pieces and soak in milk. Beat the egg lightly with salt, pepper and nutmeg. Place meat and grated cheese in a bowl. For this meatballs recipe especially, make sure there are no hard bits left in the softened bread. Then add it to the bowl. Tip the beaten egg in and mix everything well by hand. Force the meatballs mixture through your knuckles over and over. Dip your hand in cold water. Take a teaspoon full sized amount of the meatballs mix and roll into tiny meatballs. For this meatballs recipe, sizing of meatballs is important. Heat the olive oil in a wide shallow skillet. Then fry the meatballs on moderate heat for a few minutes. And roll the meatballs around so they brown evenly. Season meatballs to your taste. When the tomato sauce has been cooking for an hour, take about 1/3rd of it and place in a small pot over low heat. Add the meatballs to the small pot. Then cook meatballs in the tomato sauce over low heat for 30 minutes. Cook the spaghetti al dente. That’s critical in this spaghetti and meatballs recipe. Then scoop it up using a pasta fork or tongs. Place immediately in the skillet with the plain tomato sauce. Set over lowest possible heat. Toss well to mix. If the sauce has reduced too much add a little of the pasta cooking water to loosen it. Transfer spaghetti to individual plates. Or you could use a family style serving platter. Top the sauce-dressed pasta with the little meatballs in their sauce and serve at once. Pass around the Pecorino Sardo or Romano cheese and the grater. Have everyone help themselves! So, there you have it. The best and most authentic spaghetti and meatballs recipe on the web! Enjoy!